ROSELLE, N.J. — Dan Hurley is glad the Bobby Hurley drama is over. During the past week, as the Bobby Hurley-to-St. John’s rumors heated up, Dan Hurley’s phone blew up. Reporters, coaches, everybody wanted to know what was going on with his brother. Ironically, Dan Hurley was linked to the St. John’s opening in 2015 when Steve Lavin was let go. 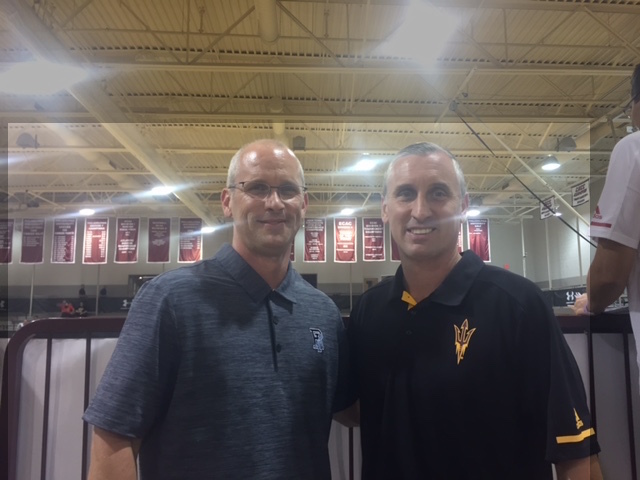 This time around, after Chris Mullin and the school parted ways, Bobby Hurley was the top target, but he ultimately agreed to a contract extension with Arizona State. St. John’s is now in flux with Tim Cluess, Ryan Odom, Porter Moser and St. John’s assistant Greg St. Jean among those in the mix. “What [Bobby] has built there [at ASU], the things he still wants to accomplish there, I think he feels like there’s still so much more he wants to accomplish at Arizona State,” Dan said. The two brothers are extremely tight, but Dan didn’t bug his brother too much in the last week on this. As for his “own stuff,” Hurley wants UConn to make a jump in Year 2 after finishing 16-17 and in ninth place in the American. “We have to keep making strides, we have to keep increasing the talent level,” he said. The Huskies lose Jalen Adams but return the rest of the team, and add recruits James Bouknight, Jalen Gaffney and Akok Akok. “For us it’s put together another talented recruiting class like we just did with the three top 100 kids and keep adding to our talent base. And the guys that are in the program have to take big jumps in their career next year,” Hurley said. Hurley is looking for the incoming freshmen to play key roles. Akok joined the team for practice in January and will suit up this fall. Meantime, 2020 will be another big recruiting class for the Huskies. They are targeting several people, including super-athletic 6-11 Roselle Catholic big man Cliff Omoruyi, who on Friday added a Kentucky offer after meeting with John Calipari and also met with Auburn’s Bruce Pearl and Pitt’s Jeff Capel. Hurley will return to see him next week. UConn is also involved for 2020 Westtown power forward Noah Collier, 2020 Oak Hill Academy wing Cam Thomas, 2020 Putnam Science shooting guard Demarr Langford and 2020 Putnam point guard Hassan Diara. Hurley and assistant Kimani Young were at Putnam on Friday.